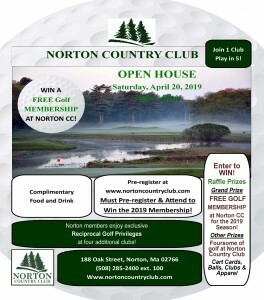 Norton Country Club is one of the most sought after destinations for Golf Outings/Tournaments in South Eastern Massachusetts and Rhode Island. Our meticulously manicured 18-hole Golf Course along with our Professional Staff are the perfect compliments to make your private event a complete success! Norton Country Club’s professional staff will assist you in the event planning process. Additionally, we handle the distribution and collection of your sponsor signs, escorting volunteers to assigned locations and our PGA Professional will handle all announcements and scoring after the round. Our spectacular Outing packages include your golf, cart, meal, taxes & fees, along with a credit to the Pro Shop!